SUMMARY: In this week’s chart, we share our respondents’ most important form fields for lead generation information capture. Share your thoughts and insights on this topic in our LinkedIn discussion group for your chance to be published as a marketing thought leader. The selection and prioritization of form fields on the landing page can potentially affect volume and quality of conversions. If you include too many required fields, volume may plummet while quality may improve. Conversely, if you include too few fields, volume may grow while quality suffers. 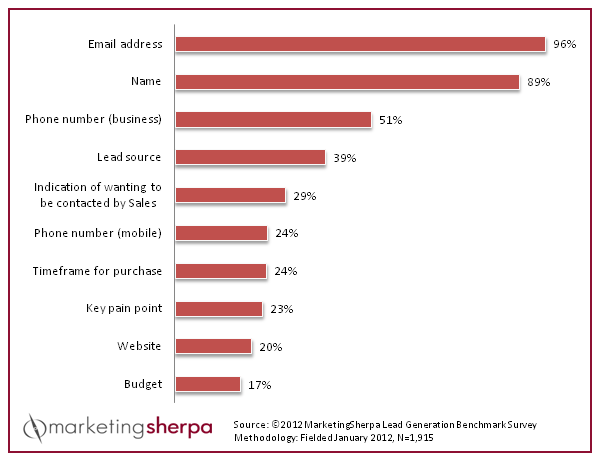 The following chart compares survey results about the most important fields for gathering lead generation information. Q: Please select the most important fields you need to collect from your leads on lead generation forms. Have you found an adequate balance of quality vs. quantity of leads? The majority of respondents indicated that names and email addresses were most critical. Collecting such minimal information on a landing page may result in a high volume of conversions, but how will this affect the quality of email lists, or for that matter, the leads themselves? What do you feel is the right balance of form fields to accrue a large number of quality leads? What trends in lead quality have you noticed when asking for less information in order to gather more leads? (-38%) drop for the next highest category. The above heuristic accounts for customer friction and anxiety -- two elements that could hamper a potential lead from completing a lead gen form and entering your pipeline. Do you feel capturing email address and name information is enough to adequately begin your lead generation and eventual nurturing? Conversely, have you seen form abandonment -- possibly due to customer friction or anxiety -- as a result of requiring too much form information? What are your other thoughts on this data? Share your own analysis in the MarketingSherpa LinkedIn Group for a chance to be published in a future blog post. Include your feedback as either a comment or a link to a blog post where you offer advice based on this data. And, for more information about lead generation tactics, be sure to download the free excerpt from the 2012 Lead Generation Benchmark Report.